Aliquippa, Pa – His Grace Bishop Mitrophan of Eastern America celebrated Christmas day at the St. Elijah Serbian Orthodox Church in Aliquippa, joining V. Rev. Stavrofor Stevan Stepanov and his parishioners on Wednesday, January 7, 2009 for the Divine Liturgy. Bishop Mitrophan was escorted into the church by Fr. Stevan and our altar boys, who then assisted Rev. Deacon Dragoslav Kosic in dressing the Bishop, all accompanied by the beautiful singing of the St. Elijah choir. His Grace Bishop Mitrophan reminded the congregation about the importance of the birth of Christ in our lives and asked all of us to always keep in mind the true and good reasons that we celebrate Christmas. On this day, Bishop Mitrophan was served by four young men who he has ordained as readers in Aliquippa: Dan August, John Bufalini, Adam Loverich, and Alex Osman. Four Sunday School students and one alumna were chosen by Fr. Stevan to sing the Antiphons and Epistle for this Liturgy: Natalie Suder and Bobby Suder for the Antiphon and Nikki Halstead the Slavonic language Epistle, Nick Kosanovich the Serbian language Epistle, and Alyssa Knapp the English language Epistle. 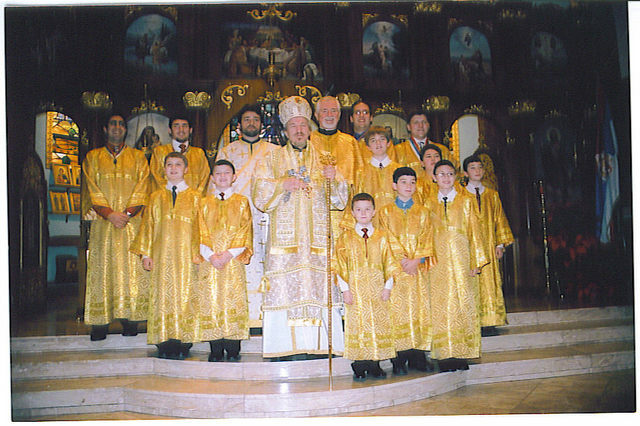 Following the conclusion of the Liturgy, Bishop Mitrphan joined the St. Elijah choir as guests of Fr. Stevan and Popadija Ana for refreshments and an impromptu concert to honor the joyous announcement of Christ’s birth. Having His Grace Bishop Mitrophan celebrate the Christmas Day Divine Liturgy with the Aliquippa parish was a perfect complement to the previous day’s Christmas Eve events. As is our custom, Fr. Stevan leads a procession to the church cemetery to cut down the badnjak and bring it to the church for a charming program performed by our Sunday School students. This year, in addition to the traditional story of Christ’s birth in the manger, the older students presented a play about St. Nicholas. Over 300 people attended this program, coming together to share in a special and unique custom of the Serbian Orthodox people.